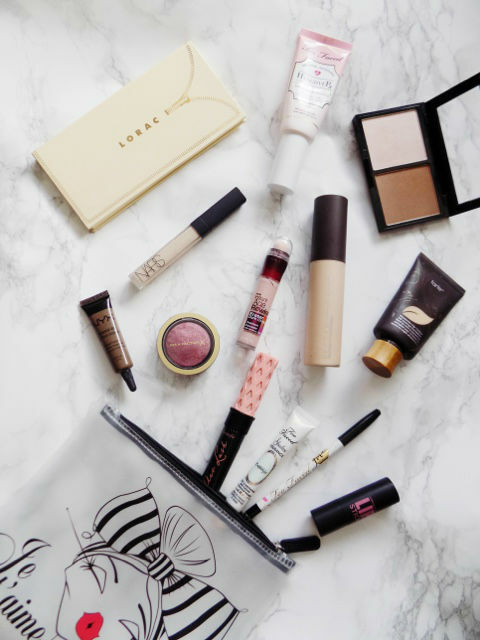 Some say to pick one focal point when it comes to your makeup. 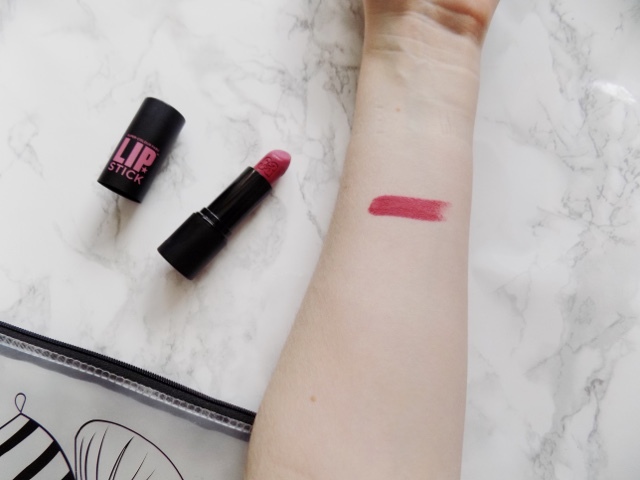 But here's a way to have the focus on both your lips and your eyes and still have a natural flush to the cheeks, with fresh, flawless, dewey skin. All words I love this time of year. If you want to see the skincare products I use to prep my skin for makeup then check out Wednesday's post here. In the autumn, hydrating primers are so important to keep my skin hydrated through the day, and the Too Faced Hangover RX Primer is the best one I've tried - the Clarins Beauty Flash Balm is also a great one for hydration and adding a radiant glow to your complexion, if you can't get your hands on the Too Faced one. 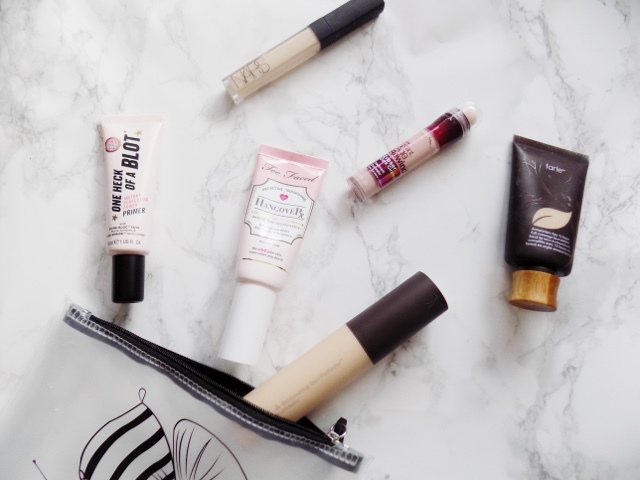 As always I love a pore perfecting primer for that smooth base so the Soap & Glory One Heck Of A Blot Primer is my newest and latest obsession when it comes to primers. I don't know what it is about them, I have a real problem with buying too many primers. I've gone for a full coverage base with the Tarte Amazonian Clay Full Coverage Foundation, but I like to add a bit of the Becca Shimmering Skin Perfector Liquid Illuminator, just to give a luminous, fresh finish to the skin which I prefer with my makeup. I could use the foundation on it's own as I don't worry about it looking dry on my skin because the primers work so well to prevent dry patches or cakey-ness. 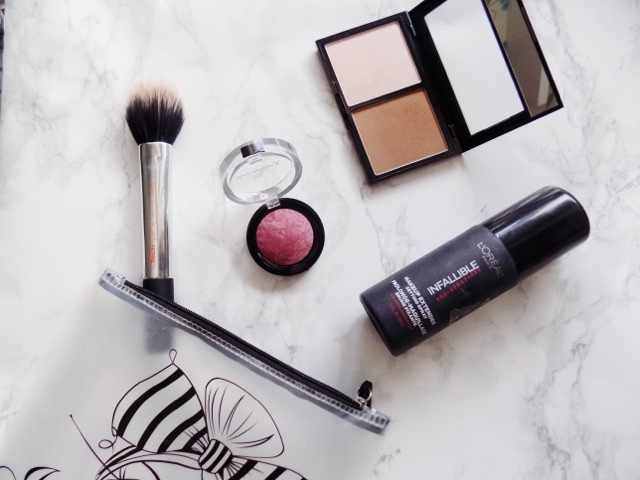 I have some terrible dark circles and my favourite product to correct them is the Maybelline Age Rewind Brightening Concealer, but the NARS Radiant Creamy Concealer is great for over the top to brighten and just conceal anything the other didn't. 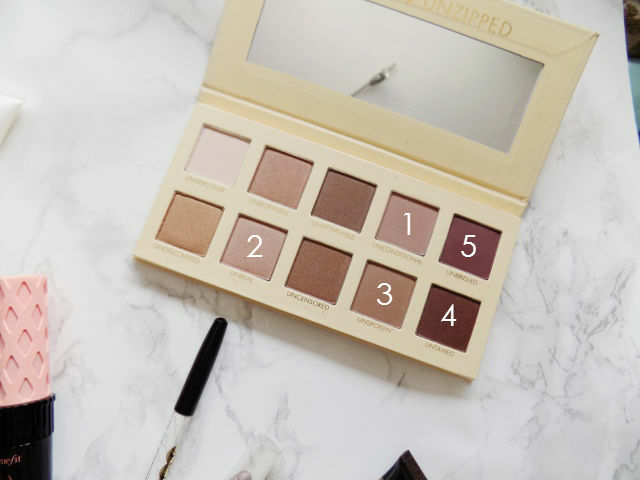 A new contour product that I've found in the drugstore is the Collection Contour Kit which has the perfect shade for bronzing and contouring your face and a beautiful shade of highlighter that would work great for your lids too. So I start with the contour powder to add some definition to my face and then I go in with the highlighter on the tops f the cheekbones, above the brows, on the brow bone and the inner corners of the eyes. This is a great highlighter from the drugstore, no big chunks of sparkle and glitter, just a fine shimmer and it's great for my fellow pale skin gals. Love it. I wanted to concentrate more on the contour and highlight for the complexion but when I found this blush in my collection I just had to include it in this look too. The Maxfactor Crème Puff Blush in Berries ?? is such a beautiful berry shade, the perfect colour to mimic the red flush you get when you go outside into the cold. I'm not a massive fan of setting my face with powder in the colder months so I just use the Laura Mercier Secret Brightening Powder under the eyes to set my concealer and then I leave the makeup longevity to the L'Oreal Pro Makeup Setting Spray (or a name something along those lines) which gives a nice dewey complexion with a natural finish. I start out by using the Too Faced Shadow Insurance to prime the eye lids, it evens everything out and keeps eyeshadow in place all day. I love this Rimmel Scandaleyes Eye Shadow Crayon in Bluffing, this is a really pretty taupe shade and I like to put this down as a base all over my lid as I just love the colour of it. Step 1. Unconditional - This is our transition shade, so it goes just above the crease so the other shadows blend seamlessly. It's a great Autumnal shade as it's a beautiful mauve so it adds some warmth which isn't my thing at all but I have been loving these kinds of shades recently. Step 2. Unreal - This is the lid shade. I am loving the more rosy/taupe shades and this is light enough for the day time but still can be used for an evening outer with more dramatic liner and even some false lashes for extra drama. Step 3. Unspoken - I used this to add some extra dimension through the crease and deepen it up a little as this is more of a brown rather than a mauve. I also like this along the lower lash line to blend out the darker colour later. Step 4. Untamed - Speaking of the darker colour for the lower lash line, this is a great matte purple-y/brown so I make sure to apply this as close to the base of the lashes using a straight brush. I also like this for the outer corner. Step 5. Unbridled - This is such a pretty deep brown with a hint of purple and it has some shimmer on so it's great for the outer corner and up into the crease to darken it up a bit. I like quite a dark outer corner but if you don't, then you can skip this shade. Once eyeshadow's on it's time for liner. I have been obsessed with the Too Faced Perfect Eyes Waterproof Eyeliner in Perfect Black which is the best eyeliner I have ever used. So I apply this on to my top and bottom waterlines and then I am going to create a wing with it on my top lashes, but then I smudge it out a little to make it a bit more relaxed and diffused. I love how this looks with liquid liner but also with this smudge-y look too. Great for this season in my opinion. Finally is lashes and my absolute favourite at the minute is the Benefit Roller Lash Mascara. This does amazing things for both my top and bottom lashes, it doesn't smudge and it separates and lengthens and just makes my lashes look awesome. Love this. 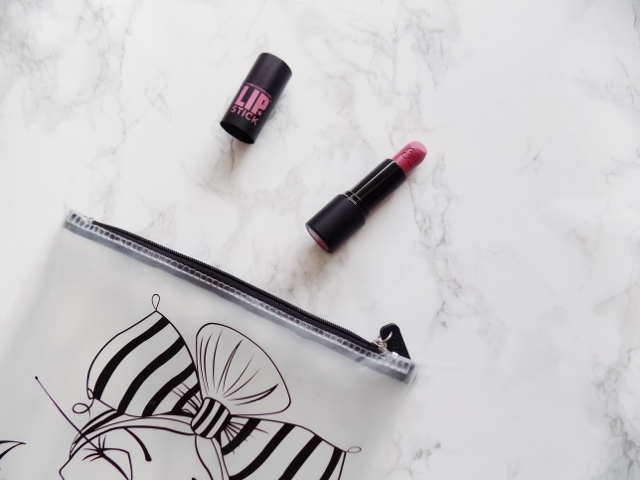 My favourite lipstick for the Autumn is the Soap & Glory Matte Pom Pom Lipstick. Look at how beautiful this colour is, and it's matte which I love, especially if I want it to last all day. I pat this into my lips to give a stain kind of look and I just love how this looks. 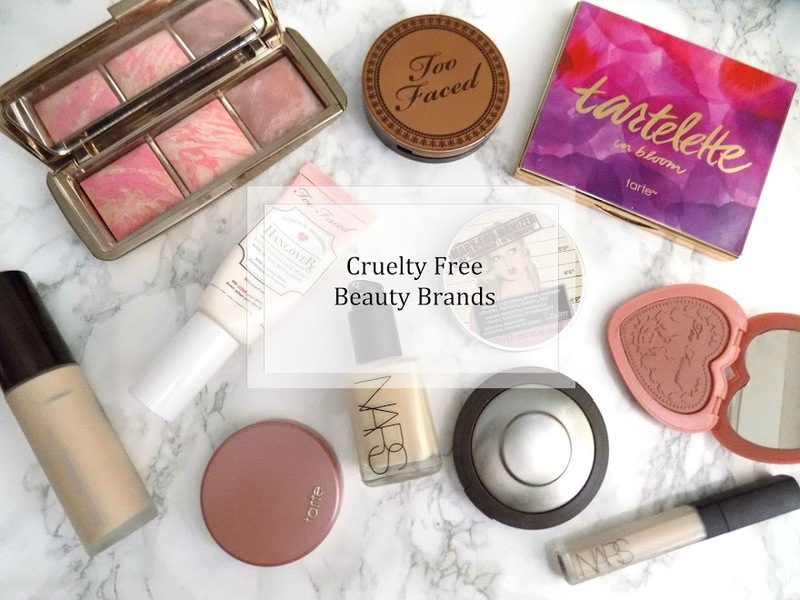 Just to recap, the 4 main things I am looking for with my makeup in Autumn and going into Winter as well is a flawless medium to full coverage, radiant skin, and hydration, and I get that with all of these products and these will all be in my makeup bag for this season. 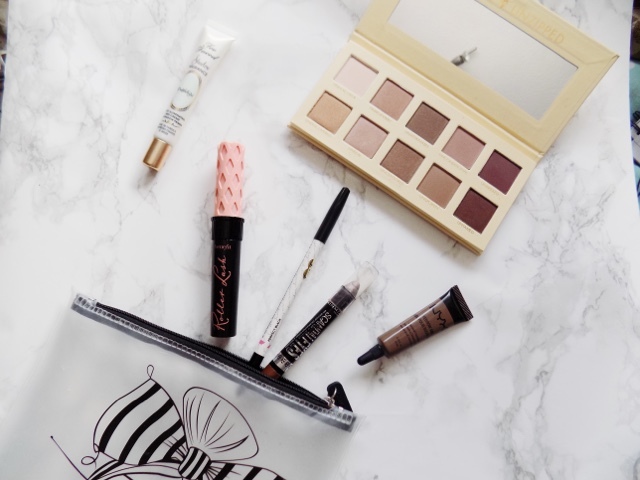 What are your Autumn makeup essentials?